Standing as stark reminders of a people’s past endeavors and hopes for the future, thousands of abandoned towns and cities can be seen around the world–some like silent, dusty museums, some little more than markers left in remembrance. Standing as stark reminders of a people’s past endeavors and hopes for the future, thousands of abandoned towns and cities can be seen around the world–some like silent, dusty museums, some little more than the wood or stone markers placed in remembrance. Yet, each speaks volumes of another time. War, superstition, famine, earthquakes,religion, man-made disasters, shifting values, fire, disease, failed economy, and hurricanes have all played their roles in reducing thriving, prosperous cities to mere rubble and models of waste. From Hong Kong to France, Turkey to Chile, here are ten of the countless abandoned towns and citiesthat still speak loudly of the people who once called them home. A former watchpost to guard against pirates, the Kowloon Walled City was built just outside Hong Kong, China during British rule. Occupied by Japan during World War II and subsequently taken over by squatters after Japan’s surrender, neither Britain nor China wanted responsibility for the deteriorating metropolis so it became its own lawless city. Flourishing for decades, it became a place where brothels,casinos, opium dens, cocaine parlors, vendors serving dog meat, and secret factories ran rampant. It was finally torn down in 1993 after British and Chinese authorities grew wary of the out-of-control population living in filthy conditions. Now a mere ghost town near the Chernobyl Nuclear Power Plant in northern Ukraine (in the Kiev Oblast [province]), Pripyat was founded in 1970 specifically to house workers of the nuclear power plant. 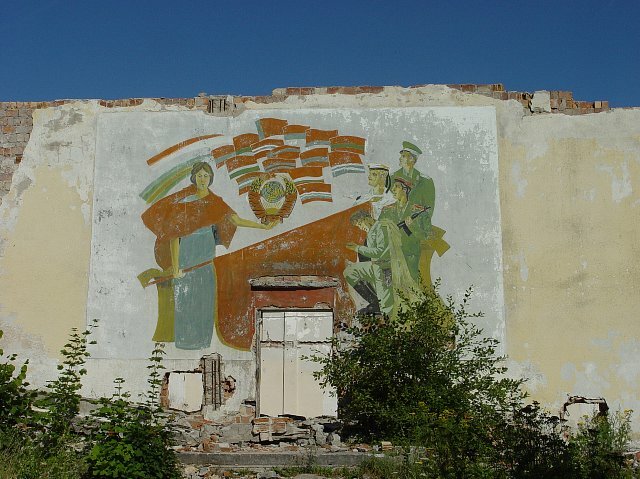 Officially proclaimed a city in 1979, it achieved a population of nearly 50,000 before being forced to abandon it in 1986 following the Chernobyl disaster. The site of one of the most horrific war atrocities in French history, the small village of Oradour-sur-Glane was the scene of a massacre perpetrated by the Germans who’d planned to punish members of the French Resistance. Intending to target nearby Oradour-sur-Vayres–instead of Oradour-sur-Glane–German soldiers marched in and disposed of 642 civilians on June 10th, 1944. According to a survivor’s account, “The men were herded into barns where they were shot in the legs so they would die more slowly. The women and children, who had been held in a church, all perished when their attempt to escape was met by machine-gun fire. The village was razed by the Germans afterward.” Today, the ruins at Oradour-sur-Glane stand as a memorial to the dead and as a reminder of that event. With construction beginning in 1978, the Sanzhi UFO houses (also known as the Sanzhi pod houses or Sanzhi Pod City), were a set of pod-shaped buildings owned by Hung Kuo Group, marketed as a vacation resort for U.S. military officers coming from their East Asian postings. The project, however, was abandoned in 1980 due to investment losses and several car accident deaths occurring during construction, said to have been caused by the unlucky act of bisecting the Chinese dragon sculpture located near the resort gates during the widening the entrance road. (Another story pointed to the fact that the site was the former burial ground for Dutch soldiers.) Despite an online petition to retain one of the structures as a museum (and it becoming the location of an MTV film on the subject), demolition on the site began on December 29, 2008, with plans to redevelop the site into a tourist attraction with hotels and beach facilities at a later date. Located a few miles inland from the port of Laderitz in Namibia, Africa, Kolmanskop was a wild and dangerous German-built diamond mining town which thrived until 1956 when diamond demand declined and richer sources of diamonds were discovered in other areas of Africa. Once offering a German style ballroom, theater, and the first tram system in Africa, the shifting sands have now filled the houses, covered the streets, and is slowly erasing most signs of civilization. Now nearly sand-bound, the abandoned city is said to be a habitat for birds, hyenas, and other wild and feral animals. Once a thriving Greek village dating to the 13th century with 25,000 inhabitants, the town was completely deserted when its entire population–along with millions of other Greeks in Turkey–were forced out of the country due to the Greek War of Independence in 1923. Since then, the village has stood empty and deteriorating. Kayakoy is cited as the largest and most well-preserved ghost village of Asia Minor. The medieval village of Craco, Italy, was built on a very steep summit to utilize its natural defense against invaders. Over the centuries, however, the village lost residents due to a plague, French occupation, civil war, and finally, lost the majority of its population due to near-famine in 1892 and 1922. The final blows were earthquakes in the 1960s which forced the remaining occupants out of the city. It now sets completely uninhabited, with a number of old world churches such as Santa Maria della Stella standing as reminders of what once was. Built solely as living quarters for the Russian Army, Polish officials have been trying to dispose of the village of Klomino for years now–last on the market for 2 million dollars. Due to lack of interest, most of its remaining buildings have been demolished, with locals destroying the remainder. It has set quietly waiting repopulation since the Russian Red Army withdrew its forces in 1992. A booming town from the 1920s through the early 1940s, Humberstone enjoyed wealth and prosperity due to the mining and processing of nitrate, also known as “saltpeter.” Once synthetic saltpeter was invented, however, the town fell into economic decline until it was finally abandoned in 1961. Now encased in sand, the town has been named a World Heritage Site and will most likely be preserved as an historical monument.